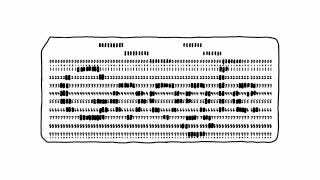 If Data Was Stored on Punch Cards, How Much Space Would Google Need? Imagine if all the world's data was still stored on punch cards: we'd be drowning in cardboard. But just how much exactly? Let's assume Google has a storage capacity of 15 exabytes, or 15,000,000,000,000,000,000 bytes. A punch card can hold about 80 characters, and a box of cards holds 2000 cards. 15 exabytes of punch cards would be enough to cover my home region, New England, to a depth of about 4.5 kilometers. That's three times deeper than the ice sheets that covered the region during the last advance of the glaciers.